Future leaders bring passion and commitment to WIHS and the local community. 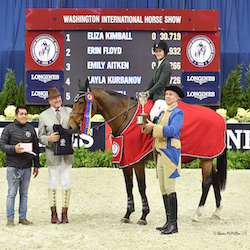 WASHINGTON, June 6, 2018--The Washington International Horse Show (WIHS), one of the most prestigious and entertaining equestrian events in North America, is pleased to announce Ana Bertozzi, 16, of Leesburg, Va., has been selected as the 2018 Youth Ambassador. WIHS also welcomes 34 local teens attending schools in Virginia, Maryland, and D.C. to serve on the 2018 WIHS Junior Committee presented by Signature Academics. "Now in its 10th year, the WIHS Junior Committee and Youth Ambassador Program represents the heart of the show," said WIHS President Vicki Lowell. "These hardworking teens are passionate about horse sports, and that's what brings them to us, but they're also actively involved in giving back to the local community throughout the year. We'd like to congratulate and thank each one of them for their commitment to this special event and their support of the local community." Members of the 2018 WIHS Junior Committee gather at WIHS for the kick-off meeting. WIHS is proud to welcome back Signature Academics, a leader in the education of student-athletes, as presenting sponsor of the 2018 WIHS Junior Committee and Youth Ambassador Program. "Our whole team is looking forward to collaborating with WIHS and the awesome kids on the junior committee," said Signature Academics Executive Director, Wendy Salomon. "We've had a great relationship with WIHS, and I know we'll continue to do great things together." With 34 members, the class of 2018 is the largest junior committee since the program began in 2009. This year three pairs of siblings are on the committee. New youth ambassador Ana Bertozzi has served as a member of the junior committee for four years and brings experience, passion, and energy to the top spot. She will serve as the organization's youth spokesperson and chair the WIHS Junior Committee, which initiates and works on volunteer activities, horse-related youth programs and community-focused educational events, such as WIHS Kids' Day, Barn Night, Military Night and Breakfast with the Mounted Police. 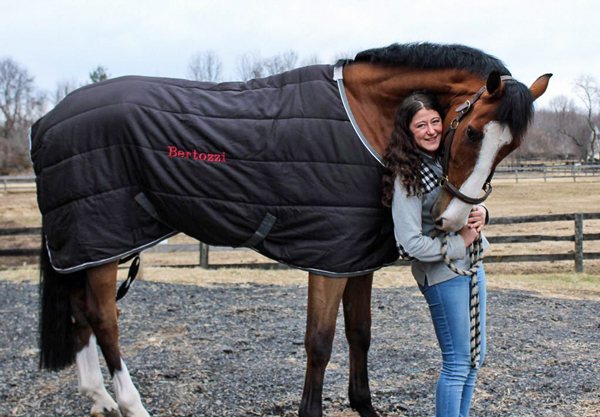 Young equestrian Ana Bertozzi takes up the reins as Youth Ambassador of the 2018 Washington International Horse Show. Her horse, Tropic Star, 7, is a recent import from The Netherlands. "His favorite thing to do is roll in the field, and eat bananas," said Ana. Bertozzi is a rising senior at Rock Ridge High School in Ashburn, Va., and this year will graduate from the Monroe Technology Center, where she studied Veterinary Science. Bertozzi is involved in Peers and Students Taking Action (P.A.S.T.A), Future Educators of America, and Future Farmers of America. She is an active competitor, showing in equitation with her horse, Tropic Star, an imposing 18-hand Dutch Warmblood. When she is not at shows, Bertozzi loves travel, photography, and reading. "I have been fortunate enough to be on the committee for four years, and this year I am looking forward to being the junior ambassador for the largest committee yet! I hope to strengthen the junior committee's role within the community by further expanding community service programs such as the Sprout Therapeutic Riding Tour that I've worked closely with the last two years," said Bertozzi. To learn more about the WIHS Junior Committee and selection process, visit WIHS Junior Committee and Youth Ambassaor Program. For interviews, contact Jennifer Wood, jwood@jumpmediallc.com. The 60th Anniversary Washington International Horse Show will take place Oct. 23-28, at Capital One Arena in Washington, D.C. Tickets will be available Aug. 1 on Ticketmaster.com and at Capital One Arena Box Office. For more information, please visit www.wihs.org, 'like' WIHS on Facebook , and follow on Twitter and Instagram. Be sure to tag WIHS by using #WIHS2018, #WIHSturns60 and #HorsesInTheCity.